A premium quality mid modulus acetoxy cure silicone sealant, that contains a high level of powerful anti-fungal compound to prevent mould and fungal growth. Typically used in areas of high humidity, such as bathrooms, toilets, showers and kitchens. 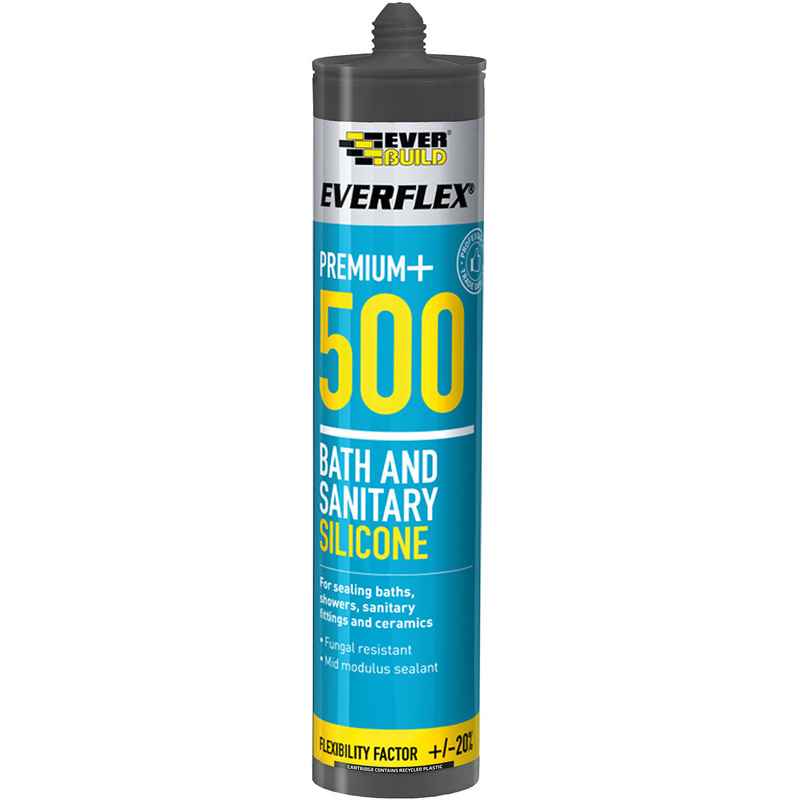 Everbuild 500 Bath & Sanitary Silicone 310ml Clear is rated 4.5 out of 5 by 27. Rated 5 out of 5 by Superchip66 from Nice consistency Not runny like some overly solvented ones, easy to tool and actually sticks to surfaces properly without getting that peeling feather edge you sometimes get. Rated 5 out of 5 by Southwestern from Good quality and value Buy this regularly... lasts well in the tube and seems to me just as good as the expensive name brands. Rated 5 out of 5 by toadovision from Works in record time I used this to repair a shower tray that I had already repaired using another brand of silicone. That failed to set, even after a month, leaving a terrible mess. The Everflex 500 sets very quickly. BUT, put a good cap on the tube you can still use it after several weeks, just perfect. I have also used this to set a sink which is only (by design) held in place by silicone, again it worked brilliantly, quick setting and a solid waterproof grip. I've tried many brands and types over the years, this is the one that works. Rated 5 out of 5 by Johns64 from Perfect finish Excellent value performs as good as the more expensive rivals.